Users are people holding personal account data that is stored in the system, which grants them access and interaction with the application. 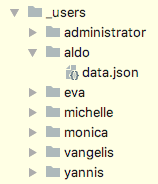 In Quanta, User data is stored into nodes (folders), just like everything else. Usually, a site's users are included in the _users folder. In order for a node to be considered an "user" its JSON metadata must contain some special field. While those other, are nothing else than the standard node fields, although used differently. As it would happen in any database, we are storing user's encrypted passwords in their related JSON file. By default we use a standard SALT - MD5 algorithm to store passwords. We are also planning to make the algorithm changeable via a hook.